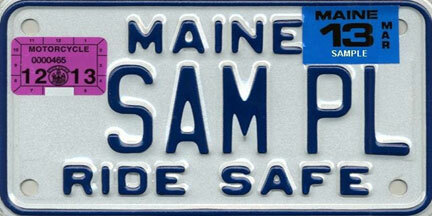 Motorcycle Inspection: United Bikers Of Maine - Protect your rights - The latest Maine motorcycle inspection requirements. Last session, the legislature passed LD 221, “An Act to Make Changes to the Motorcycle Inspection Program.” LD 221 changed the law to require the motorcycle inspection sticker to be displayed on the vehicle’s registration plate. Previously, a law was scheduled to go into effect to require the inspection sticker’s display on a mounting bracket, or on the motorcycle’s rear fender. The new requirement starts in March, and will be phased in over the next year. The inspection sticker will be placed in the plate’s upper left corner. In order to accommodate the inspection sticker, all motorcycle registrations (except those classes not required to be inspected) will be changed to a fixed March expiration. That is, starting in April 2012, when a motorcycle is registered or renewed, the expiration date will be changed to expire in the next March. The registrant will be issued a combined month/year sticker, which should be placed in the upper right corner. In order to transition into a mandatory March expiration, registration fees and excise taxes will be prorated for the correct number of months. BMV has modified and tested our computer system to correctly calculate prorated motorcycle registration fees. The Bureau has provided our municipal agents and their computer vendors with instructions for the proration of all fees. However, motorcycle registrants should review their registration fees and taxes at the point of registration. If it appears fees were not prorated correctly, they can be most easily corrected at the counter. The standard annual motorcycle registration fee is $21. In the future, when an owner registers a newly acquired motorcycle, the registration fee and excise tax will be prorated to reflect a March expiration. However, fees for delayed renewal will be calculated in accordance with existing state law, and generally full fees will be charged. That is, after the transition to mandatory March expiration is complete, anyone renewing late will be charged full annual registration fees and excise taxes, as is the case today.